There is nothing better than soup on a cold day. Scratch that. 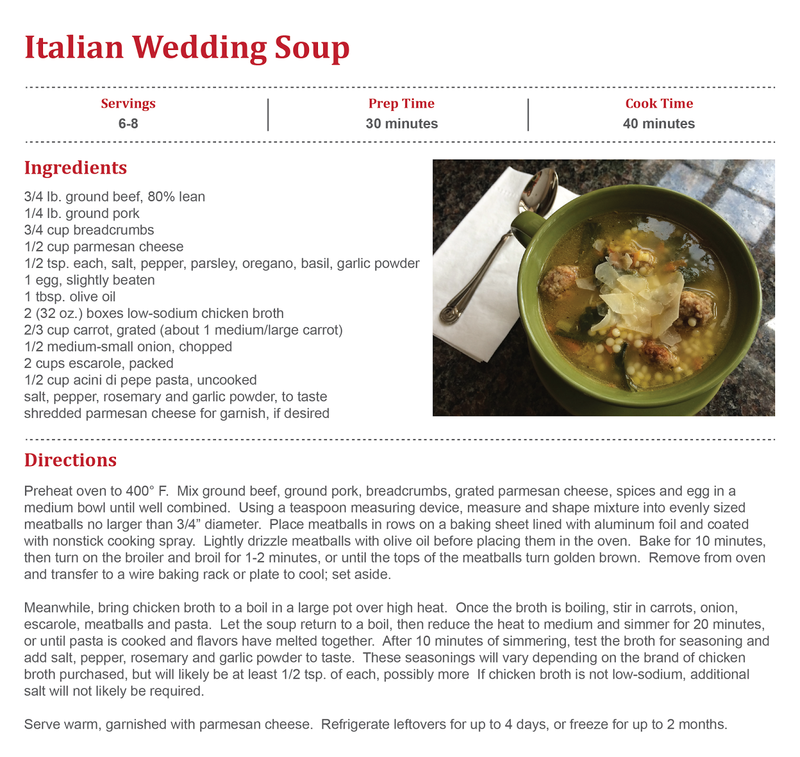 Nothing better than Italian Wedding Soup made on the Saturday morning of a cold weekend so you can reap the benefits for Saturday and Sunday's lunch and dinner! Howie and I have been loving every minute of it! 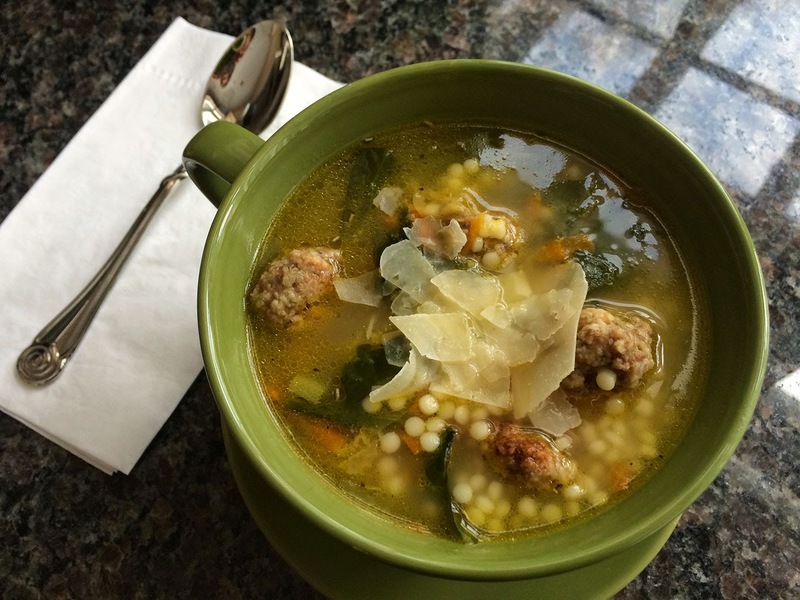 I know it's starting to warm up...and all you can think about is how much you want to bust out your grill...but you gotta try this Italian Wedding Soup. How could you resist homemade, oven-baked meatballs soaked in a savory broth with tiny little pearl pastas? I can't! And besides, the highs are still around 40. Despite the fact that every car I've driven past today has had it's front windows cracked open, it's still pretty darn cold outside in any non-Clevelander's eyes! Warm up with this delectable creation. Mmmm! 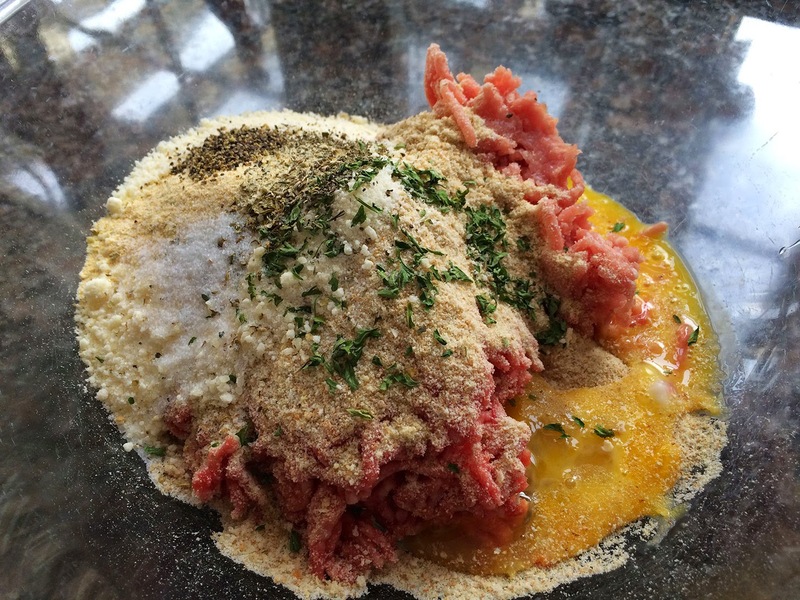 I started by mixing ground beef, ground pork, breadcrumbs, grated parmesan cheese, an egg, and a bunch of dried herbs in a medium mixing bowl. You can customize the herbs to create the flavors that you typically like, but I used parsley, basil, oregano, garlic powder, salt and pepper in mine. A very traditional Italian group of herbs! I started mixing everything together with a spoon, but I found that putting a ziploc bag over my hand so I could forcefully push the ingredients into one another was the best way to do it! After the ingredients were combined into a smooth mixture, I used a teaspoon to measure out the meat into equal sized portions. 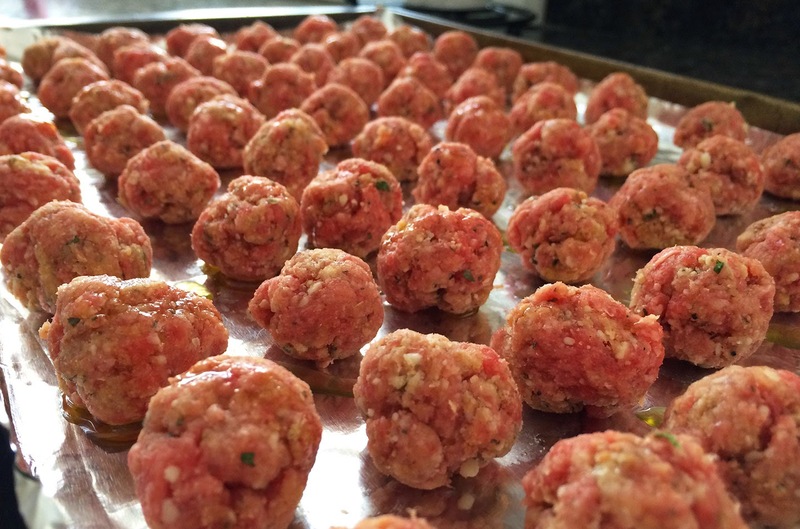 I didn't measure out all 70 meatballs this way - yes, you're really gonna make that many - because that would take forever! 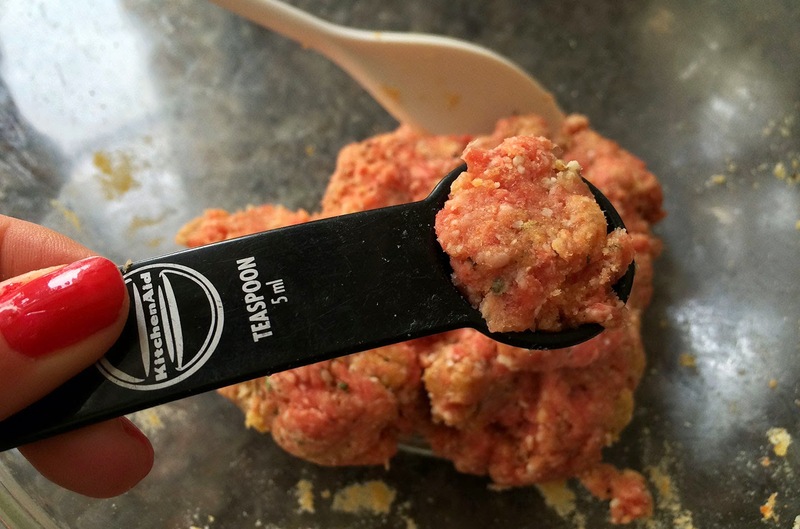 I just did the first 6 or 7 meatballs until I got a handle of what the size should be, then eyeballed the rest! Before you start rolling them out, line a baking sheet with aluminum foil and coat it with nonstick cooking spray so they don't stick. 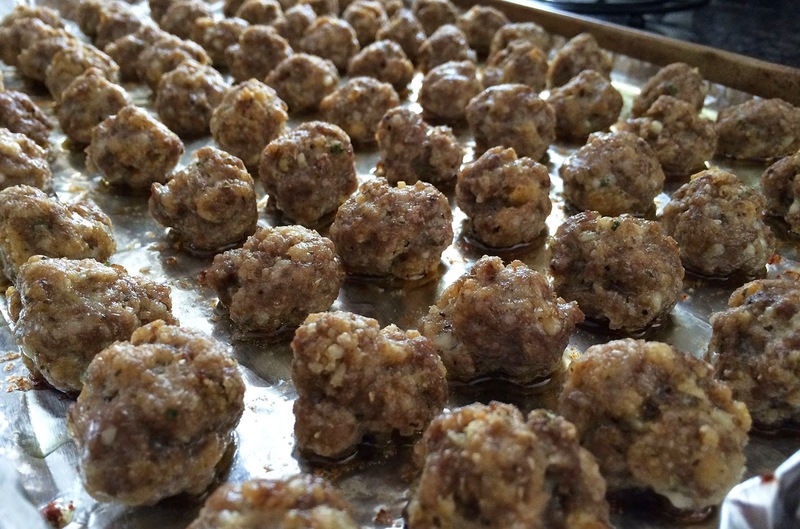 Place all of the meatballs on the tray in even rows so they have some breathing room, then drizzle olive oil lightly on top before you stick them in the oven. It's finally time for the soup part of the recipe now! I brought 2 (32 oz.) boxes of low-sodium chicken broth to a boil in a large pot. 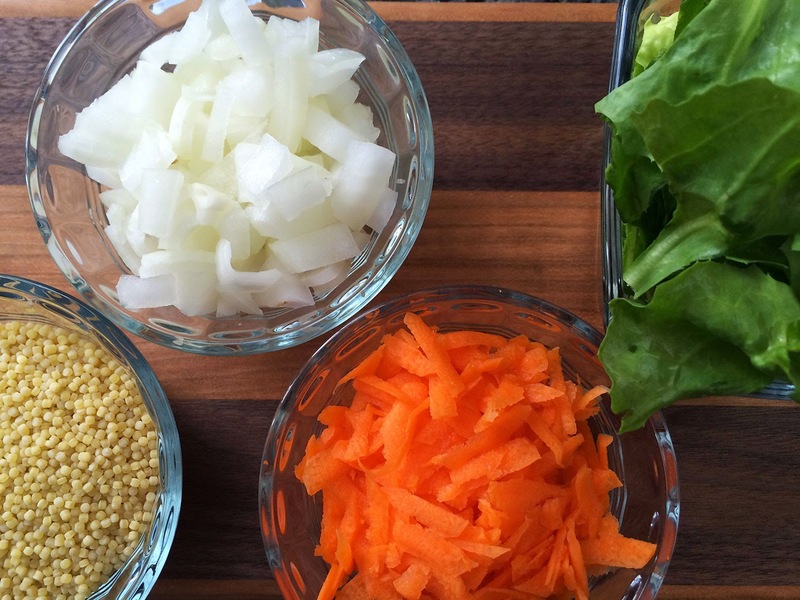 While the broth was heating up, I grated a large carrot and chopped half an onion and a couple of cups of escarole. Bet you thought the wilted leaves in Italian Wedding Soup were spinach, right? Nope, escarole! It's basically a leaf lettuce that can withstand heat much better than the red or green leaf lettuce you typically buy in the store. It's found in the same area of the produce section too! If you can't find escarole, feel free to substitute spinach, but I really prefer the delicate texture of escarole! Once the broth was boiling, I added the veggies, meatballs and 1/2 cup uncooked acini di pepe pasta to the pot. Let the the mixture come back to a boil, then reduce the heat to medium and simmer for about 20 minutes until the pasta is fully cooked (it'll quadruple in size!) and all the flavors all melt into one another. About halfway into the simmering process, I tested the broth for flavor and added some salt, pepper garlic powder and rosemary to give it a flavor boost. Seriously SO GOOD. I ladled the soup into big bowls and topped them with a little parmesan cheese for garnish. Parmesan can seriously make anything taste better, it blows my mind! You gotta try this recipe though, it's so stinking good!